The start of November marks the movement into what I consider the winter season, though it is still really fall. Last weekend and this past week, we got the last of the planting done: cover crop, fava beans and garlic are all in. The first annual rye grass seed that we planted for cover crop is germinating (we planted over two weekends). Hopefully the vetch and the second round won’t be far behind. Since we had some rain this weekend, it should speed things up a bit. Once I mulch the fava beans and garlic, the field work will be done for the season, except for a little more harvesting. 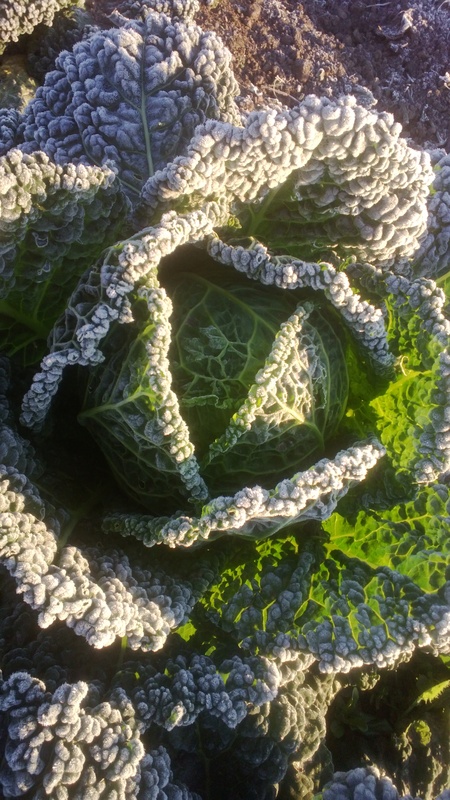 Last Monday and Tuesday nights, we had two good, hard frosts. The temperatures were down to 29 degrees by our house, but I think it got colder out in the fields. The only sensitive thing we covered with row cover out in the fields was the celery. The cucumbers and peppers were in the hoop house, though it even got cold enough in there to do in the cucumbers. They were done producing anyway, so that was okay. It was a good run with the hoop house cucumbers. I don’t think I’ve ever had them last through the end of October before. The peppers are still doing fine. Now for the persimmons. 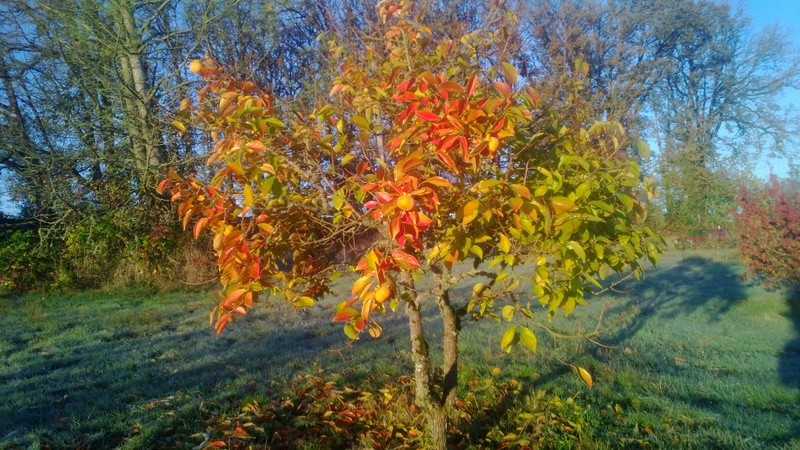 Just before the frost, I realized the persimmons were ready to start picking. Last winter, when we moved here, there were still persimmons on the trees. They were the first I’d ever eaten. Since I hadn’t eaten them before, let alone grown them, I had (and still have) some learning to do. What I have learned, is that are two categories of persimmons: astringent and nonastringent. The variety we have, Ichi Ki Kei Jiro (or Early Jiro), is nonastringent. For the nonastringent category, once they have colored, they are ready to start eating. At this stage, they are still firm and crisp in texture, and the flavor is sweet and mild. If they are allowed to soften up a bit, the flavor increases. You can wait until they are really soft, almost jelly-like, for the fullest flavor. I will need to do some experimenting with what happens when you leave them at room temperature versus in the refrigerator. From what I have read, they may not keep long at room temperature, though I don’t know how long “not long” is. 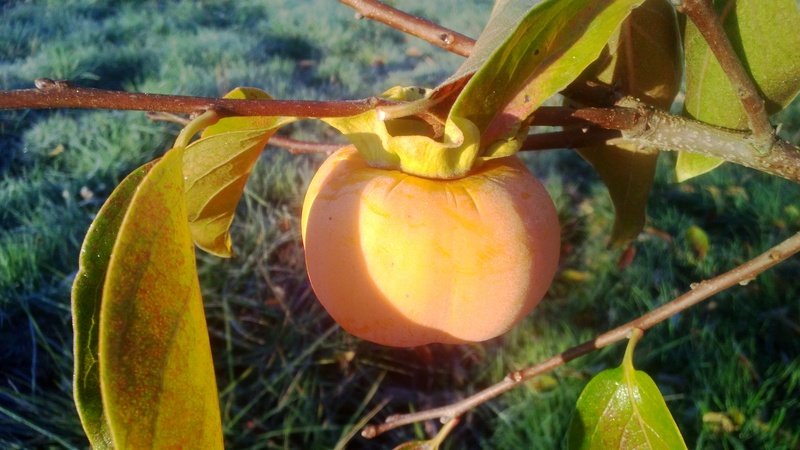 If anyone out there is more familiar with persimmons, I’d be happy to have you share what you know.